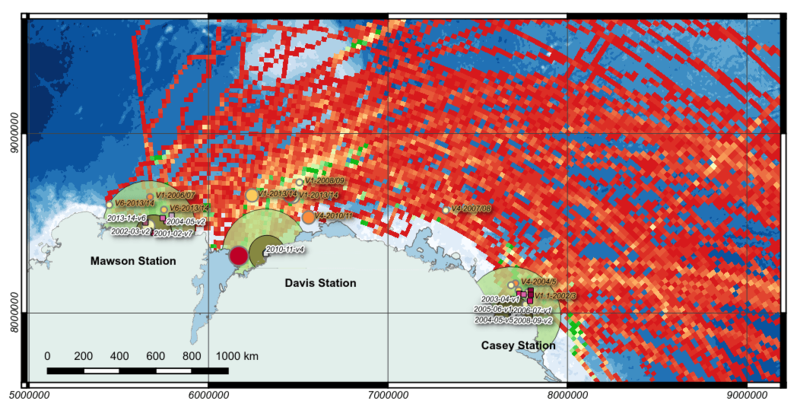 In late 2014 I was contracted by the Antarctic Climate and Ecosystems Cooperative Research Centre to analyse Antarctic shipping patterns from 2000 to 2014. The aim was to extend a planning report first published in 2008, and provide deeper insights into shipping patterns in order to plan for future shipping seasons. Obvious shipping routes arise as a combination of crew experience, average sea conditions, sea ice conditions and logistical constraints. Shipping is expensive, so great effort goes into minimising ship time required for a given task. Days can be saved or lost by the choice of shipping route. Hugging the coast in transit between stations is clearly the shortest route – but seasonally the most risky due to the presence of sea ice. So what routes are being used most often? and do they work? Mining data from shipping reports and ship GPS traces, I was able to map where and when ships had difficulty accessing stations. While plenty of maps exist showing ship tracks, there has never been any analysis of where and why ships had difficulty getting to stations. The map presented below is one of the first. It shows a ‘heatmap’ – a frequency count of hourly ship positions per 25km square grid cell. Overlaid on the map are labelled round indicators of ship ‘stuckness’ due to sea ice conditions (as opposed to delay for operational purposes), and squares where ship to shore helicopter access was forced by ice conditions. This map says nothing about seasonality, or the times of year which are most risky for ships. It does show a clear preference for routes to and from stations, in particular Casey and Davis. It also shows that generally ships transit between the two stations by heading north to skirt sea ice, or hugging the coast – which is clearly troublesome at times. For the most part, ships get to stations and back with few dramas.